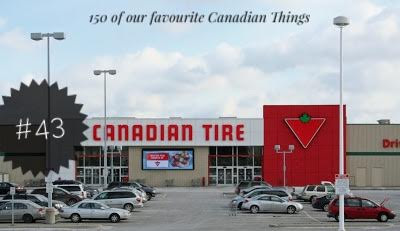 Canadian Tire, informally known as “Crappy Tire” is a department store with a heavier focus on automotive products. With over 500 stores, it is rumoured that 90% of Canadians live within a 15 minute drive from the nearest one. Most of their locations also have a garage where you can get repairs done to your vehicle although I do not know many people who would get more than an oil change done there. Canadian Tire originated in Hamilton Ontario in the early 1900’s after John Williams Billes and Alfred Jackson Billes bought the Hamilton Tire and Garage Ltd Company. In the 1920’s they launched their first catalogue in southern Ontario and began taking mail orders for automotive parts. They set up shop in downtown Toronto in the 1930’s and since then have blossomed into the national brand they are today. In the 1950’s Canadian Tire branched out and began operating gas stations under their banner as well. 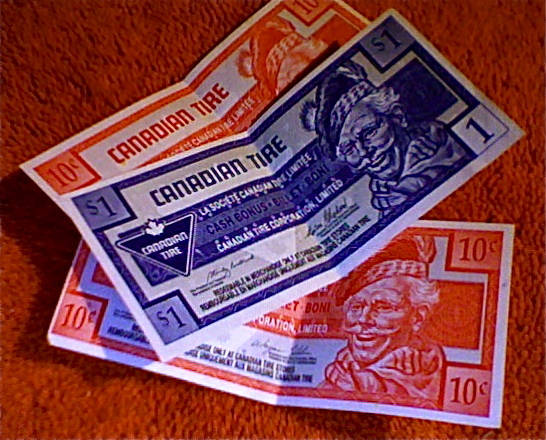 During the 1950’s Canadian Tire also introduced a loyalty program that is still in existence today; Canadian Tire money (CTM). For every purchase made in the store the customer would receive CTM back (value based on how much was spent) and the CTM could then be used on future purchases. There are bills in values of 5¢ 10¢ 25¢ 50¢ $1 and $2. In keeping with modern times the loyalty program has begun shifting to the digital age; where you show your loyalty card and get your CTM added electronically instead of paper notes. The neat thing about Canadian Tire money is that some businesses across Canada have been accepting it as currency on certain products. A burger chain called The Works allows guests to pay in CTM for their “Crappy Tire” burger. Rogue recording studio in Toronto accepts CTM at par to the Canadian Dollar (which Toronto based recording artist Corin Raymond used to finance a live album in 2011) and a now closed Pete’s Peanut Pub in Calgary would accept CTM in lieu of cash for drinks and food. Canadian Tire has managed to stay near and dear to the hearts of Canadians while big American corporations keep pushing their way in. 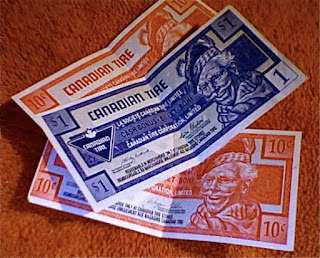 There is a sense of loyalty to the brand for the way they advertise on how to survive “Canadian life” and of course by offering up a secondary set of monopoly coloured money.